It was serendipity, a happy accident, by which I met Krithika Subrahmanian. A long conversation, a few days before a scheduled trip to Chennai with art gallery owner, Sharan Apparao, had led me to call the architect to explore the changing lifestyles in the southern metropolis. And, that was enough to initiate a meeting in her home, to discover that the soft-spoken architect/dancer merges her several worlds – that demand different creative sensibilities – into one synergised whole. 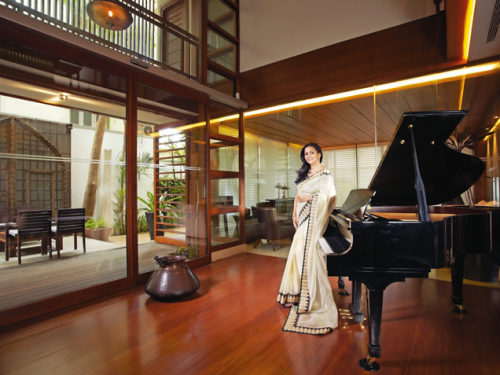 Her firm – Transform – was launched in 1996 and in the interim years she has worked on some of the most high-value homes of Chennai and in a few other cities of India as well. Her first project was an apartment building with seven residents – and it is still standing. Transform began with one employee and it now boasts of 78 full-time architects and engineers. The firm specialises in retail spaces that are design oriented, corporate offices, individual firms and the largest volume of villas and apartment buildings in the city. I walk into her home in a shaded by-lane in Besant Nagar – my first impression is one of ample space, a sense of openness that is derived from the generous use of glass in its structure. As one room leads to another and one floor to the next, there is a feeling of fluidity in the way the spaces complement each other. She chooses to wear saris for the camera stating that this is how she dresses to work, even though she may wear more casual Indians and Westerns for other occasions. There is a grace in her movements that comes from her years of learning dance – in fact, she was a dancer long before she became an architect and Subrahmanian says the performing art has honed her sensibilities in many ways.